Radiofarda – Workers’ protests at the Haft Tapeh Sugar Cane Mill in Ahvaz, southwest Iran, continued for the fifth consecutive day November 9. The workers say they haven’t been paid since August and are demanding answers about the future of the industrial complex, which was once a source of national pride but has been struggling financially since it was privatized in 2015. Periodic strikes and workers’ demonstrations have become a fixture of life at the mill. Workers say they are often not paid their salaries for months at a time and their wages and benefits have been cut since privatization. The state-run Iran Labor News Agency (ILNA) reported November 8 that the names of a number of the complex’s shareholders and members of its board of directors are on an official list of individuals who have violated currency exchange regulations. Earlier reports suggested the company’s largest shareholder and director general had either fled Iran or been detained by the authorities for violating the new strict regulations on foreign exchange transactions. “Some say the director general has fled the country to avoid being arrested, while others say he has been arrested and held in custody for violating the new law on forex transactions,” Ali Nejati, a former mill employee, told Radio Farda. However, the judiciary has so far refrained from making any comments on the fate of the vanished director general. “Not only have the workers not received their salaries for months and no New Year’s bonus, they have also been subjected to legal prosecution instead of their employer being held responsible,” their officially unrecognized union wrote in a recent statement. The Haft Tapeh Sugar Cane Mill is the only factory of its kind in Iran. It was built nearly half a century ago during the reign of last Shah of Iran, Mohammad Reza Pahlavi. The agro-industrial complex was always lucrative until the Islamic Republic decided to sell it to the private sector in a murky transaction in 2015. The complex, built on a 2-hectare area, was sold to the private sector for a down payment of roughly two million dollars. It is not clear if any further payments have been made. It wasn’t long before the privatized company had accrued large debts (over $90 million in 2017), mostly owed to public utilities and tax authorities. To address the problem, the private owners of the complex decided to withhold salaries, wages, and pensions. This decision triggered strikes, making sugar production increasingly unreliable, to the extent that the Iranian government poured imported sugar into the local markets. Meanwhile, the private owners of the complex complain that the government has stopped buying the mill’s products, forcing it into deeper crisis. 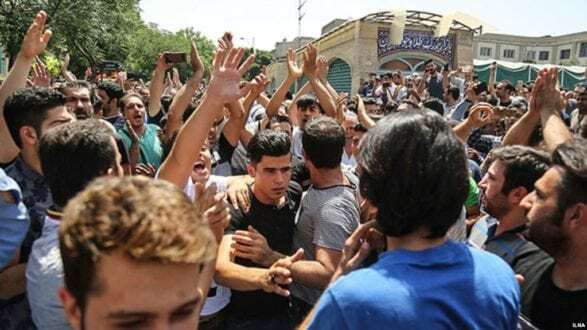 The Islamic Republic’s Supreme Leader, Ayatollah Ali Khamenei, has said he believes the unrest among the workers is a “foreign plot” to overthrow the regime. “One of the major activities of our enemies has been to create a recession and obstacles in our factories and among our labor groups — particularly the big ones — so they can provoke the workers,” Khamenei said in one of his shortest speeches ever, addressing the Congress Of 14,000 Martyred Laborers February 5.